As good as a holiday to me, escaping to the market. Let's face it, the garden's dreary right now and the thought of raking leaves only serves to add to the hum drum so it's off to la Marche for me. Let your eyes and stomach do the walking. Beautiful isn't it? Sarlat is one of the most perfectly preserved medieval towns in Europe. To wander unhurried through her cobbled streets taking in the sights, sounds and smells of one of the best gastronomic markets in the region is a delight. In the absence of any hard frost, mushroom season continues. Some years are better than others for the fickle Cepe and there have been occasions when the market is just brimful with this particular boletus, literally crate fulls stacked high, other times they're less plentiful. Queue for Choucroute, it's worth the wait. Who doesn't love good coffee? Beans are roasted on site at the Brulerie Sarladaise, and this fabulous old machine does the trick. The fire is stoked into the burner on the left, the heat travels along the pipe to the drum, beans are poured into the top, the drum slowly turns and the coffee gently roasts. The smell is out of this world, heavenly. France embraced canning in a big way. I think it was Escoffier who referred disparagingly to the "cuisine of the can". Entirely unfair of course, these are some of the best canned delicacies money can buy. Well you could easily find your own chestnuts but life is so much easier when someone else has peeled them for you. Oh thank you so much for the glorious pictures! I have a weakness for cheese too. 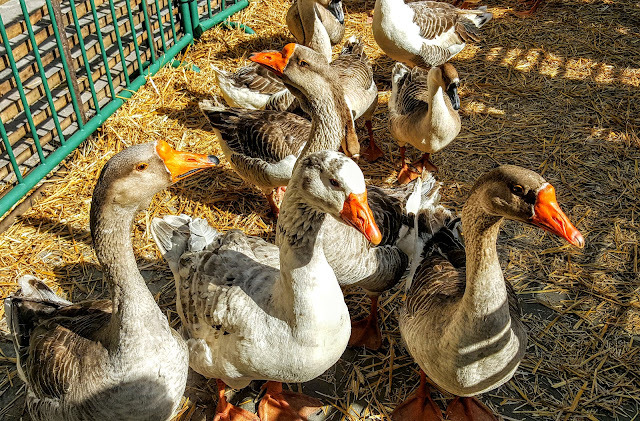 I can't decide which picture I like the best, but I have to admit, Escalopes de Foie Gras de Canard sounds pretty good to me! But perhaps we'll have bread and cheese for supper tomorrow. Don't do it often enough. Thank you. Oooooh. Almost too much goodness, almost. A fabulous tour of the Sarlat Market Rob! I agree that the smell of roasting coffee is heavenly. Coffee and bread and cheese, who could want anything more? and then a stop off at "le Floumont" for Escalopes de foie gras de canard . Superbe!! What a wonderful market, so much better than we have over here - though we have a so-called French Market. That cheese! Thank you for a wonderful diversion. No matter how much we try over here, this sort of ambiance and authenticity takes a long time to produce. I hate you, too. We just got back from a trip to Iowa City, and though pleasantly bohemian with better food options than Lincoln, NE, it doesn't hold a candle to France. So, that means Lincoln doesn't even hold wax, or something. Cheers. Wonderful! Great photography. Love the way the lighting gives all the subjects a soft look. Did it just turn out that way, or were you using special settings? Thanks to every one for your comments. The light that day was as it's been for too many days recently, dim and grey. The camera strips out even more so I simply lightened them back up to how they appeared to the eye just using picassa. In truth I now realise that the grim morning November light actually is pretty good to shoot in. Thank you for posting. These are such beautiful moments and these photos are delightful! I can smell the coffee! I find myself in a trance sighing with my mouth watering! What a wonderful place to visit on market day! I've gotten behind in reading your blog and I'm so glad I finally got a chance to get caught up. I've been driving my husband crazy lately telling him we need to go on a trip to France soon. Seeing all of your pictures makes me want to go even more. The food in the market looks so good, I'm starving now! 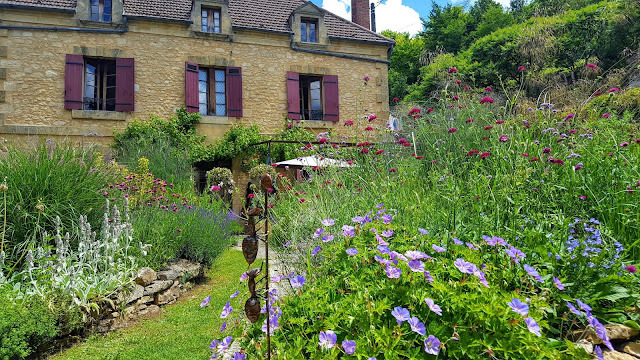 Hi Rob I have been so tardy with garden blogs of late Sarlat looks a lovely place both my Father and my daughter speak highly of it having both been there. Great to see you putting the Hazel to use they make such excellent frames. Lots of lovely posts about your garden the pergoda walk looks amazing lots of flowers and the lighting in the garden looks great so inviting hope you had a hugely successful season. The dry garden looks promising and such lovely stone work. I really must make more time for my garden blogs hope all is well with you and your wife. The colors are so warm and golden. The fresh bread and cheese looks delicious! What is it about an open market place that gets the blood moving. Great photos. Wish I was there. Thank you for this scrumptious tour Rob! What a charming village and you are a master at making art from walls of food. It would seem you have the best of everything in your life! Fabulous images. I loved Sarlat when I was in the Dordogne...and I so want to go back there very soon! How did I miss this post?! I'm drooling at all that gastronomic gorgeousness now! I have to say that Sarlat appeals to me more at this time of year than in high summer. We went there after visiting you and it was HEAVING - we didn't stay long! I'm off to make a cup of coffee and pretend it's from the Brulerie Sarladaise! Lovely and delectable. Part of my heart is in France where I loved every market, every simple bowl of soup, every bite of bread. Thanks for this tour Wonderful. C'est un plaisir de découvrir le patrimoine gastronomique français au travers de votre blog ! Roast coffee beans, peeled chestnuts, the smell of fresh bread, glorious cheese ... hello ... let my eyes and stomach walk beside you! Sarlat is one of the most beautiful villages in France. The Saturday market is one of the prettiest. I regret I haven't found the time to return. I shall always cherish my visit there a few years ago. The walnut wine is also very good, try some. In just a few pictures, you have shown me how much I love France. Thank you. I will be back in France in May! 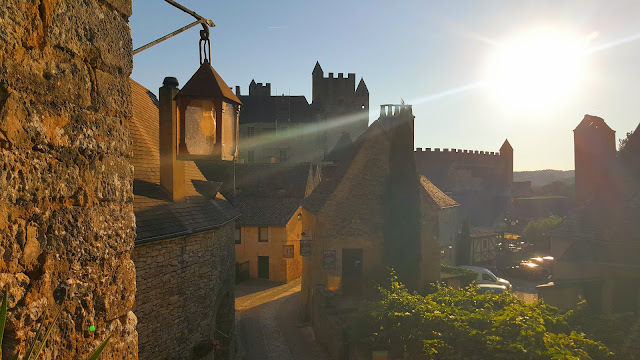 What beautiful photos-I so love Sarlat-the food is amazing. It is a beautiful little French town.